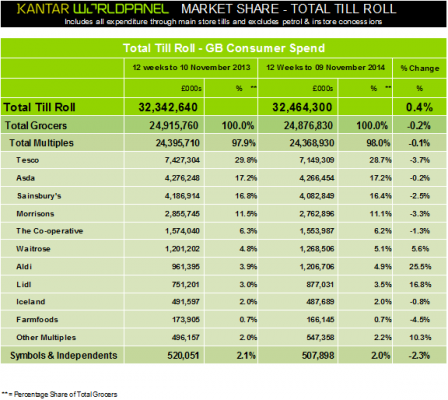 The latest grocery share figures from Kantar Worldpanel, published today for the 12 weeks ending 9 November 2014, show that for the first time since Kantar Worldpanel records began in 1994 the British grocery market has fallen into decline, with sales down 0.2% compared with this time last year. Aldi continues to benefit from the disruption within the grocery market, said Kantar. Its sales are 25.5% higher than last year and the retailer now has a record high market share of 4.9%. Lidl has also performed strongly with a 16.8% sales increase bringing its market share to 3.5%. At the other end of the market, Waitrose has grown sales by 5.6% taking share to 5.1%. The major supermarkets have all had a difficult period, hit by both the flow of shoppers toward the discounters and reduced revenues as they competitively cut prices. Asda has recorded the best performance among the big four. Its sales have fallen in line with the overall market and share has held steady at 17.2%. Sainsbury’s and Morrisons have both recorded a decline in share compared with last year with sales down 2.5% and 3.3% respectively. Tesco’s sales are down by 3.7% although it is worth noting the rate at which it is losing market share has slowed, said researchers. © 2015 RetailTimes.co.uk All rights reserved.